Store pesticides in locations out of reach of children and pets, away from food items, and away from water sources. Storage locations should be out of the potential path of runoff from rain or flood waters. Do not store pesticides near heat, sparks, or open flames. Keep containers tightly closed in a cool, locked, and well-ventilated location. Make sure the storage area is in good repair, doesn’t leak, and has sturdy shelving. Always store pesticides in the original container. A common mistake is pouring a pesticide into a container other than the original. This is against pesticide label law and has led to poisoning and accidental spills. It is best to store pesticides in areas that will not freeze. If a pesticide freezes and expands, a glass or plastic container may crack and leak. Be prepared for accidental spills or leaks when using and/or storing pesticides. Proper pesticide spill management includes control, contain and cleanup. To prevent a pesticide spill from contaminating non-target sites, it must first be controlled by stopping the pesticide spill from becoming worse. Examples might include up-righting any overturned containers or bags or repairing a leaking hose. After controlling the spill, promptly contain the pesticide so it cannot spread beyond where the accident occurred. A liquid pesticide can move to a non-target location fairly quickly, and rainfall can lead to contaminated stormwater run-off. Excess granules left at a spill site can later be carried by rainwater to water resources. Using material that will soak up the pesticide is the easiest way to contain liquid; and granules can be swept or scooped. Keep kitty litter or other absorbent material in your pesticide storage location for such emergencies. Do not use a garden hose to wash a spilled pesticide off of a driveway or sidewalk into a street where they next rainstorm could carry it to surface water. After the pesticide is contained, it should be cleaned up according to the label. How correctly to cleanup a spilled pesticide and dispose of it, can be found on the pesticide label. Whether it’s a commercial pesticide or one available for homeowner use, always protect yourself when cleaning up a spill with the appropriate Personal Protective Equipment (PPE) as recommended on the label. 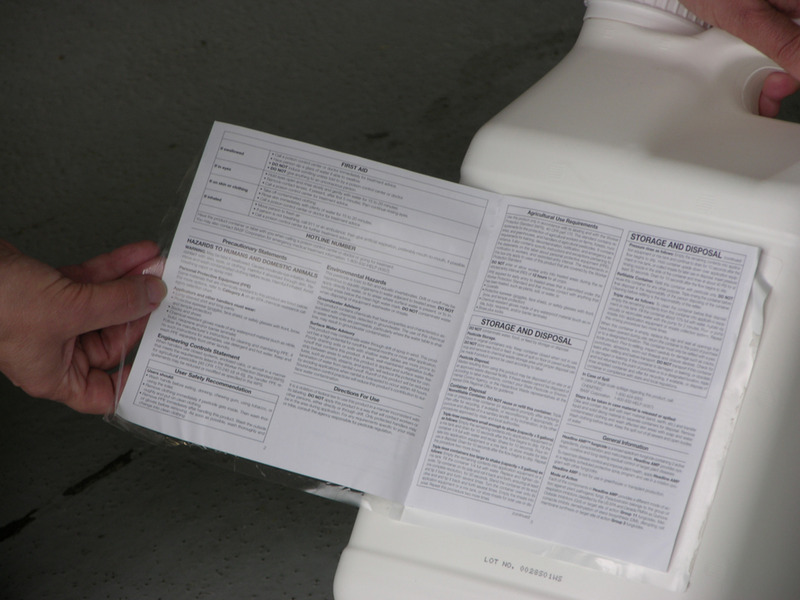 It would be wise to read this label information before using and/or storing a pesticide. Consider keeping a “spill kit” readily available that contains emergency numbers, PPE, shovel, and recommended items to use in case of a spill. Keep the kit where it is easily accessible in the case of a pesticide spill. If the spill happens near water or gets into water, contact the Nebraska Department of Environmental Quality at (402) 471-2186 or (877) 253-2603; the Nebraska Department of Agriculture at (402) 471-2351; and the Nebraska Game and Parks Commission at (402) 471-1111. When faced with a pesticide spill emergency, there are many phone numbers you can call for assistance. The pesticide label should provide a 24-hour emergency help line or you can contact the Nebraska State Patrol.